This last week-end, I have learned GLSL, so now I should be able to create simple shaders to be used in the game. The second one is an outline shader I made to replace the old system that consisted in using a second sprite that was displayed under the weapon to make it look like it has an outline. 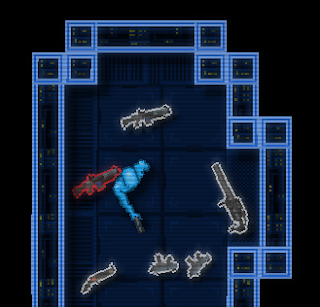 With the old system I had to create a second version of each weapon sprite and modify it with an image editor. Now it's a lot more simple! It's some sort of scanline filter, but instead of making some lines darker, it actually makes them more transparent. It will be used on texts for the HUD/UI, and after testing it on bullet trails, I think it looks cool and I'm going to use it on them (the effect in the gif is a little bit too strong though). Just wanted to say I'm totally following this devlog, Superhotline Miami was SO cool and is probably one of my favourite browser games yet. I've played the current build of this game, and although it's quite cool, I found it ran somewhat slower and laggier on my computer than Superhotline Miami. Although I totally get that this game is obviously more graphically advanced, just thought I'd let you know, as one of the great things about Superhotline Miami was how fluid the whole game was, how incredibly smooth, even on levels with fifty enemies. Anyhow, good luck on continuing the game's development, I'll be following you! How might you like Classic Sega Genesis amusements like Sonic and Knuckles or comic tie-ins like the X-Men. You can get them for just a couple bucks.